I first learned about hugelkultur from a doco on Sepp Holtzer I saw at Rainbow Valley Farm a few years ago, but I have never used it. Until now. Through a fortunate series of events, a large pile of small sticks landed on our 700 square metres of sand and weeds about 4 months ago. One of our main objectives has been to build organic matter in our soils. The pile sat for a long time until last week when we decided to experiment with hugelkultur while shifting a compost pile and planting apple trees in the lee of our recent wind break project. This is what it looked like around noontime. 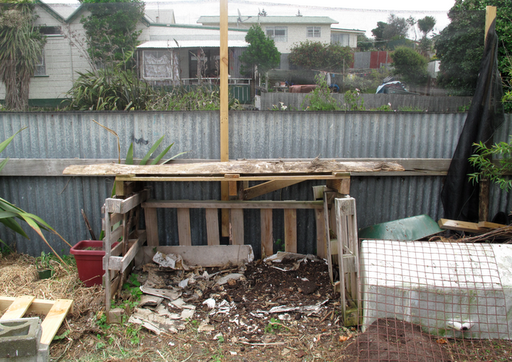 We raked the compost away from the fence and took the pallets away. It may be hard to see in this shot, but the grade drops away abruptly before the fence. This served as a pre-dug trench ready for hugelkultur application. But I did not want organic matter against the iron fence or the timber rail which would be buried in the process, so I used rubble and broken bricks to create a space between the sticks we would be burying and the fence. … and raked the compost back on top of the sticks. Later, we leveled the area with black sand from the beach. To add extra carbon and calcium to the apple trees we lined the bottom of the holes with paper and crumbled pieces of Gib (dry wall). And provided plenty of compost to the saplings. By late afternoon this untidy corner of the section looked like this. This growing season the pumpkins will run over the ground and provide a living mulch. Next year the trees should begin to fill out in the lee of the wind netting and fill out to hide the corrugated iron fence. We’re hoping that as the tree roots grow outward the buried sticks will decompose and feed the apples for many years to come.